Students at Ashesi are asked to assume a leadership role in developing the university's on-campus culture. 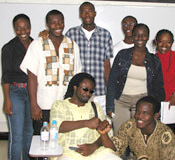 As Ashesi's first generation of students, they have the unique opportunity to form new student organizations, to initiate new activities, and to establish traditions. Ashesi's goal is to create an environment that enables students to build a strong community. Through efforts in student selection, campus development, and faculty/staff selection and training, we give students the raw materials and tools that enable them to build a community based on Ashesi's core pillars of scholarship, leadership and citizenship. Ashesi's early classes have already started to develop a campus community that engages new students on many levels. Students have set up a student club, coordinated trips to Kumasi and Wli Falls, volunteered at a soup kitchen, raised money for homeless youth, ran their own film festival and even took salsa lessons. With more students joining Ashesi's campus in the coming years, the student community promises to become even more active.